Visit the graves of legendary Golden characters. Hear stories about their lives from famous storyteller, Dennis Potter, Museum volunteer since 2008 and retired Jefferson County Sheriff’s Department Captain. Read Dennis’s profile. Tours begin and end at the Golden Cemetery. This program sells out every year, so get your tickets early. This is a rain-or-shine event; weather will not force a cancellation. Registration is required. Program will be canceled if minimum attendance number is not reached 24 hours prior to start time. Membership pays for itself with just a few programs for your family. Join us. 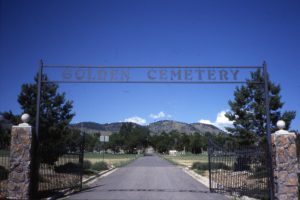 The City of Golden owns and operates the Golden Cemetery. Among the historic notables buried here is George West. West, a Golden founder, started the Colorado Transcript newspaper in 1866. 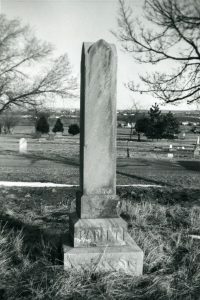 Additionally, Seth Lake, builder of Astor House in 1867, is buried in the Golden Cemetery. Many other pioneers and characters of the early west are at rest here. Learn how a Golden Museum Rental offers unique experiences that range from rustic to ritzy.